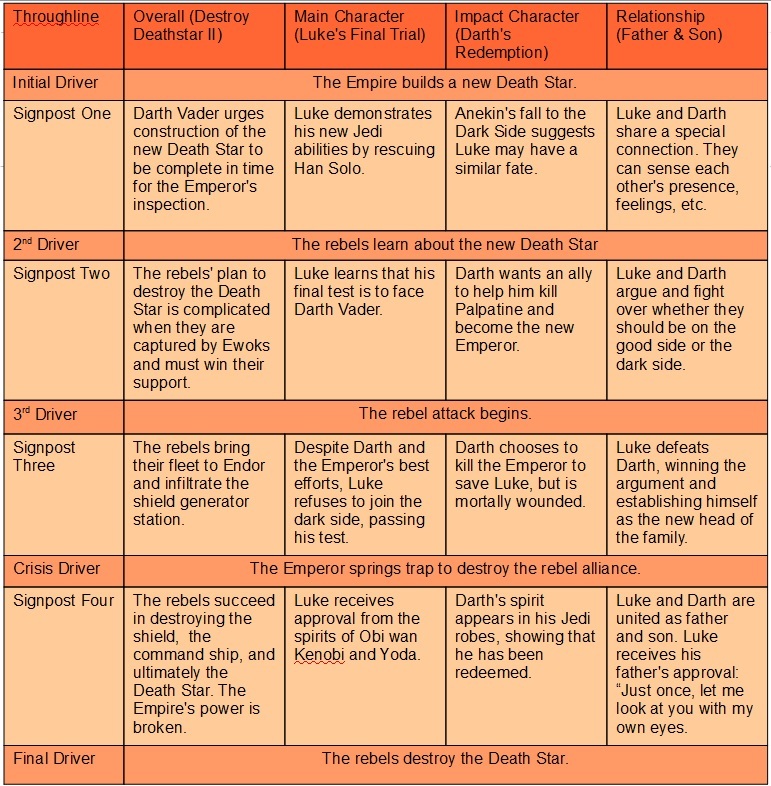 Some time ago, I did a quick analysis of Star Wars: The Return of the Jedi in order to illustrate Dramatica's concept of the four major throughlines that appear in a well structured story. In particular, I wanted to point out that good stories often have four crises which occur more or less simultaneously, yet should be illustrated separately in order for the reader to appreciate them. One of the biggest traps we fall into as writers is the tendency to simplify things. And one of the ways we simplify our understanding of stories is that we try to take several different story points and reduce them to one point. We have to fight this natural tendency because it makes our concept of a story more shallow. 1. The Overall Throughline. This throughline concerns the protagonist’s pursuit of the story goal, the goal that involves or affects most of the characters in some way. 2. The Main Character Throughline, concerning the main character’s inner conflict over whether or not to change and how it gets resolved. 3. The Impact Character Throughline. This presents how the impact character influences the main character by demonstrating or arguing for a different way of handling problems, giving the main character a reason to consider changing. 4. The Relationship Throughline, which follows the evolving relationship between the main and impact characters. Note that a "signpost" in Dramatica can be a single event, but is usually a sequence of events that make up a distinct phase in a throughline's development. So the third signposts of each throughline, taken together, make up the third act of the story. Signpost 1: We see Darth Vader urging construction to speed up in time for the Emperor's inspection. Driver 2: The Rebel Alliance learns about the project. Signpost 2: The rebels launch an effort to infiltrate the Empire's stronghold on Endor, destroy the shield that protects the Death Star, and then use their fleet to destroy the Death Star. This effort is complicated by their need to win the support of the indigenous Ewoks. Driver 3: The rebels launch their attack. Signpost 3: The rebels make some initial progress infiltrating the shield generator station and the fleet arrives at Endor. Driver 4 (Crisis): Emperor springs a trap for the rebels (the Death Star is fully operational, and the Imperial fleet is there). Signpost 4: With considerable effort, the rebels manage to turn the tables. They destroy the shield, and the Imperial flag ship. Driver 5: The rebels destroy the Death Star. Signpost 1: Confident in his new Jedi powers, Luke rescues Han Solo from Jabba the Hut. His training is nearly finished. Signpost 2: On his deathbed, Yoda confirms that Darth Vader is Luke's father and that Luke's final test before he becomes a Jedi will be to defeat Darth. Signpost 4: Luke, having conquered his dark side and made the right choice. receives the approval of the ghosts of Obi wan and Yoda. Signpost 1: Luke learns that Anekin Skywalker, his father, was seduced by the dark side and became Darth Vader. The story implies that Luke could make the same mistake and become a Sith Lord. Signpost 3: Darth’s personal crisis is the moment when he chooses to sacrifice his ambition to save Luke from the Emperor. He kills the Emperor at the cost of his own life. Signpost 4: Darth’s redemption is shown when his ghost appears to Luke in Jedi robes. He is Anakin Skywalker once more. Finally, we the Relationship throughline of The Return of the Jedi concerns the relationship between Luke and Darth. Signpost 1: In the beginning, we see that Luke and Darth have a connection. They can sense each other’s presence. Signpost 2: When Luke and Darth meet face-to-face, they argue about whether they should be on the dark side or the good side. Curiously, there is no talk of going their separate ways. It seems they want to be on the same side, whatever that is. 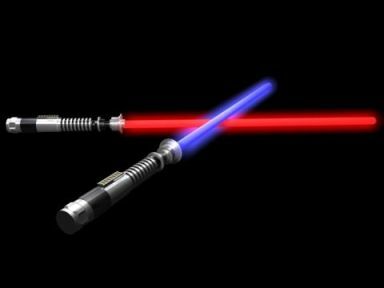 The conflict builds as they end up fighting each other with light sabres. Signpost 3: The climax of their relationship occurs when Luke cuts off Darth's hand. This settles the argument and establishes Luke as the new dominant male of the family. Signpost 4: Luke and Darth, having reconciled their differences, behave like father and son for the first time. Darth asks to see Luke just once with his own eyes rather than through his mask. It is a symbolic representation that Luke has now become a man, and that Darth recognizes him as an equal. Luke then takes on the role of a good son. He saves his father’s body from the exploding Death Star II and gives him a proper cremation. Overall Crisis: The springing of the Emperor's trap. Relationship Crisis: Luke's battle with Darth over which side they should be on, and over Leia, whom Darth speculates could be another potential Sith. Main Character Crisis: Luke's ultimate conquering of his dark side by setting aside hate and refusing to kill his father. Impact Character Crisis: Darth' redemption from the dark side by choosing to sacrifice himself to save Luke. According to Dramatica theory, it doesn’t matter what order a writer puts the four Signposts of Act 3. All that matters is that Signpost #3 of any throughline comes after Signpost #2 of the same throughline and before Signpost #4. It would make little sense, for instance, for Luke to defeat his father before their conflict arises or after their conflict has been resolved. I think you’ll agree that if any of the signposts had been left out of The Return of the Jedi it would have created a hole in the story. It would have made one of the throughlines incomplete. You will also note that more than one signpost can appear in a scene. Sometimes the signposts are crowded together, especially near the crisis. In other stories, they are more separated in time and space. A signpost can sometimes be a single event, but more often that event is broken up and told through a sequence of smaller events. The important thing is that each signpost is illustrated separately so that the reader/audience appreciates that it has occurred. Below is a summary of all the signposts in Return of the Jedi. Please note that this is designed only to show how each throughline unfolds, not the exact order of events in the film. Signposts for "The Return of the Jedi"
Incidentally, you can read the original script of The Return of the Jedi at the Internet Movie Script Database.